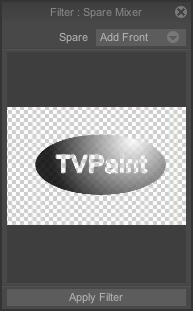 It is possible to virtually store the current image in order to use it at a later time (mixing options) or to use specific drawing modes (Merge or Impressionist modes). This image is referred to as spare image. The following examples will provide a better understanding of this notion. Above you will find the options available in the Edit > Spare main menu. 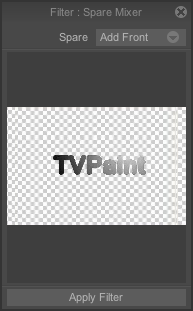 Save the TVPaint logo opposite as a spare image (main menu Edit > Spare > Copy to spare or shortcut [Shift+J] ). 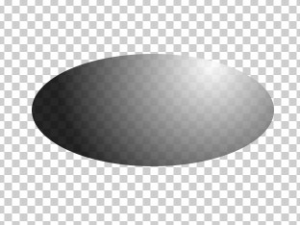 Delete it from the current layer (standard delete tool: ), then draw an ellipse with an opacity of 75% in its place. 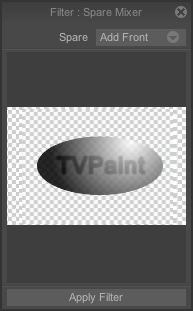 * The option Swap spare (shortcut [J]) returns the TVPaint logo to the screen and replaces the spare image with the ellipse. Using this function again will redefine the TVPaint logo as spare and will display the ellipse in the center of the window. * Finally, the option Delete spare is used to delete the spare image. If you are working with several projects at the same time, note that each project has its own spare image. When you save a project, the spare page is also saved with this project.